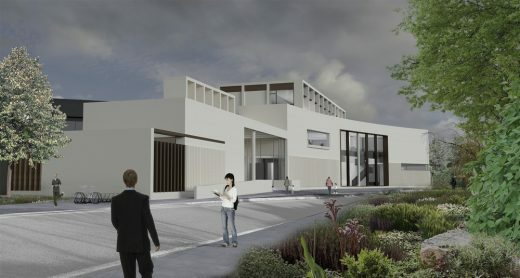 The new Clare County Library, designed by Keith Williams Architects in Ennis, County Clare, Ireland has been granted planning consent. 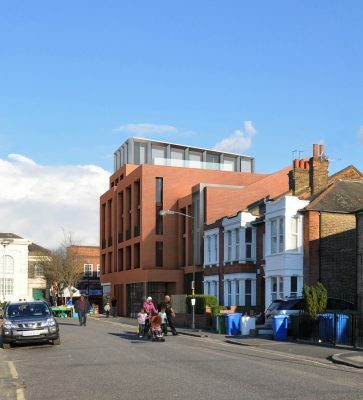 Keith Williams Architects’ residential-led project at 38-44 Rye Lane, for developer Reality Holdings, has been unanimously approved by Southwark Council. Keith Williams Architects has been shortlisted to take part in the RIBA Competition to design the new Southmere Library, the focal building within the ongoing regeneration of London’s Thamesmead. 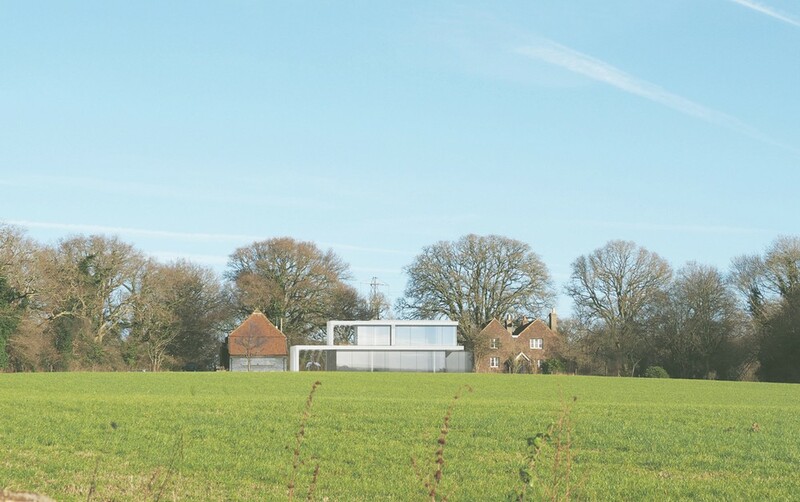 The international architectural contest, which is backed by housing association Peabody and the local authority Bexley Council, attracted 58 entries. The new £4.5 million civic building, will sit within a masterplan by architects Proctor & Matthews and Mecanoo, on the south side of Southmere Lake close to the easternmost terminus of the new Crossrail line at Abbey Wood. The landmark project is part of Peabody’s phased £1.5 billion regeneration of the 1960s housing estate, which notoriously featured in the film A Clockwork Orange, and will provide new, existing and future generations of the local community, with a state of the art library and civic building. Competitors have until 21 September to submit their proposals with a winner to be announced in November. 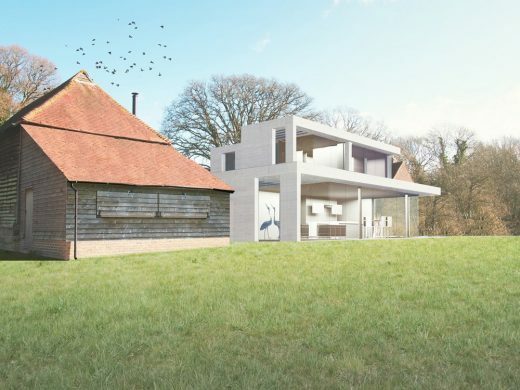 Keith Williams Architects has secured planning permission for a new contemporary farm house near Cowfold in West Sussex, in the High Weald AONB. North Farm House, a 240sqm two storey building will occupy the courtyard site of a partially demolished former large agricultural covered yard, becoming the farm estate’s nexus at the centre of a cluster of three traditional farm buildings namely an C18th timber framed barn, a brick built former dairy, and a C19th brick cottage which it will adjoin. The new house presents relatively closed elevations to the three existing buildings to its west, north and east, before opening up toward the south with expressive horizontal planes and large areas of glazing to engage with spectacular views across the Estate’s rolling farmland, the Weald and to the South Downs beyond. “Securing permission for a contemporary house in the countryside is never straightforward and we are delighted that the project has been approved after some 18 months of careful and patient dialogue with the planners at Horsham District Council. We now plan to start the technical design phases and move toward construction in the new year”. Keith Williams Architects have been selected to design the new Clare County Cultural Centre in Ennis in the west of Ireland for clients Clare County Council. Conceived as a new cultural hub for the town and the region, the 2,300m2 project will extend the existing Glór Theatre (2001) adding a new Library and Art Gallery. 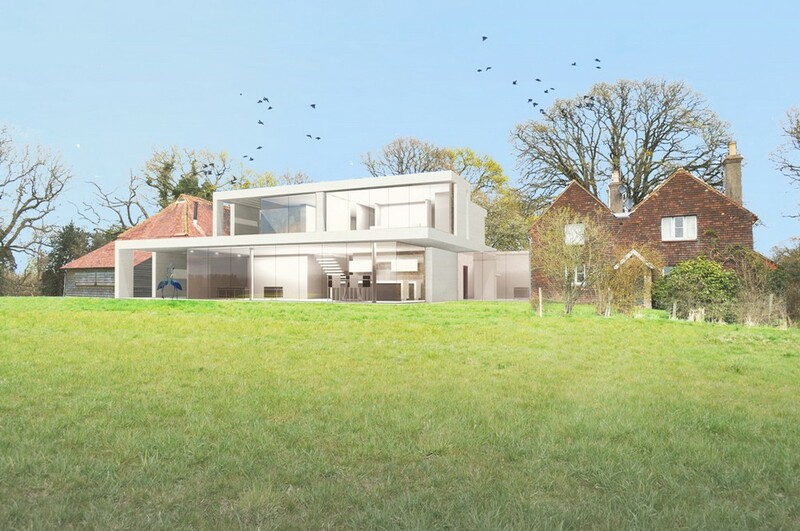 The project is scheduled to be submitted for planning consent later in the year. The Civic Trust Awards is delighted to have appointed the distinguished architect Keith Williams as Chair of the Civic Trust Awards National Panel. Keith has been an integral part of the Civic Trust Awards Panel for several years and for the 2016 programme onwards, has taken over this important role from David Prichard of Metropolitan Workshop who has stood down after 11 years in the post. The 2016 award winners will be announced at the Civic Trust Awards Ceremony which takes place in London on Friday 4 March. Athlone’s Luan Gallery has received the architectural award for the Best Cultural Building of 2013 under the Royal Institute of the Architects of Ireland’s (RIAI) annual awards programme. The award was presented to the Luan’s architect Keith Williams founder and design director of Keith Williams Architects by Ruair Quinn, TD, Minister for Education and Skills and Michelle Fagan, President of the RIAI, at Dublin’s City Hall 4 July 2013. Keith Williams Architects were major winners, bagging 3 Civic Trust Awards in an exceptional night for the firm at the annual Civic Trust Awards ceremony at Cardiff City Hall on Saturday night (9 March). The firm’s Marlowe Theatre, Canterbury and the Novium Museum, Chichester both won Civic Trust Awards whilst the Novium also won the Michael Middleton Special Award for the best New Building in a Conservation Area. This new museum building is the culmination of a 10 year endeavour by the Council, to replace the city’s former museum, with a new building that would more effectively display the breadth of its collection. The winner of a RIBA design competition, the Novium is 2 1/2 times larger than its predecessor, a small cellular 18th Century building elsewhere in the city. Work is approaching completion on a new museum in the heart of historic Chichester, West Sussex, designed by Keith Williams for client Chichester District Council. Williams was successful in the 2007 RIBA Competition to design the new museum, which is now known as The Novium. The main building was completed in autumn 2011, whilst the exhibition designed by Event Communications is in progress ready for the museum’s formal public opening, in July this year. A team led by Keith Williams Architects with Buro Happold has been shortlisted to design the new €32 million Concert Hall in Bochum near Düsseldorf, Germany. The project for the new “Bochum Musikzentrum” is being organised by the City of Bochum and supported by the Bochum Symphony Foundation. The 4,700m2 site is located in the centre of Bochum and is part of a wider master plan for the regeneration of the city quarter, “Kreativquartier Viktoria Quartier Bochum”. The project objective is to create a new home for the Bochum Symphony Orchestra centring on an outstanding 1,000 seat concert hall. In addition to the main concert hall, the project includes a 250 seat multipurpose hall and new facilities for the local music school. The currently vacant 19th Century Marien-Church located on the site is to be preserved and will form an integral part of the overall scheme. The teams have until 4 May to complete their proposals. Keith Williams Architects supported by EPR Architects and Pakistan based engineering group ESS-I-AAR, is heading a consortium which has made the final cut to design a vast new city to the south-east of Karachi. KWA’s group, which also includes engineers Atkins, Malachy Walsh and SLMJR Management Consultants, is now one of just two teams still in the running for the new city which will eventually house 10 million inhabitants. KWA’s project will establish a conceptual vision and a long term strategy leading to the ultimate creation of the new city of Zulfurikabad. Located in Sindh Province, historically the land of the saints and Sufis (Islamic mystics), within a 400 square mile area of the country adjacent the flood delta of the Indus, KWA’s vision for the project embraces major environmental issues in defining a new low carbon based urban morphology, whilst relieving overcrowding in Karachi itself. Keith Williams Architects which is best known for its celebrated cultural and civic projects, including the Marlowe Theatre, Canterbury, Wexford Opera House, The Unicorn Theatre and Athlone Civic Centre, has also been involved with urban planning for many years. The Zulfurikabad project however will mark a major upscale in the development of the practice’s oeuvre. Keith Williams’ 24 storey residential and commercial project at Black Prince Road in London’s Vauxhall has been approved by the planning inspectorate following a 4 day public enquiry. Keith Williams Architects has ended the summer with invitations to compete for a clutch of high profile cultural projects in Austria, Norway and Germany. In Austria, Keith Williams is the only UK architect to have been shortlisted to redesign the 1980’s Kulturzentrum in Eisenstadt, the seat of the Esterházy dynasty who were important patrons of Joseph Haydn, in a town which has become famous for its annual Haydn festival. The €15 million project aimed at redefining the centre’s urban setting and external expression, involves the extensive remodelling of the existing building, upgrading its 800 seat auditorium, whilst creating a new wing housing a 200 seat theatre, art gallery, foyers and support spaces. In Tønsberg near Olso, Williams’ office is again the only UK participant among 7 international architects to design the new Støperiet Culture House which will restore a former wharf building dating from 1903, and a 3,000 sqm new cultural building containing a theatre, galleries and music teaching spaces. In Frankfurt, in the Dom-Römer Areal (above) the historic city centre which links the cathedral and the old rathaus, Keith Williams has been invited to design proposals for a new multi-functional public exhibition and event building, on a site containing a series of medieval and roman archaeological remains immediately adjacent to the city’s Historisches Museum. In nearby Alzenau, Keith Williams has been asked to propose designs for a new music school and 1,000 seat multifunctional event hall. Competing against firms such as Snøhetta, Jo Coenen, Kleihues & Kleihues and Ortner & Ortner, Keith Williams Architects has until early November to submit its designs for all 4 projects. 2009 has been a busy year for Keith Williams with the first major monograph on the firm’s work entitled Keith Williams : Architecture of the Specific (Images Publishing) due to be released in November, its 1200 seat Marlowe Theatre complex in Canterbury now under construction and its Chichester Museum due to start at the end of the year. 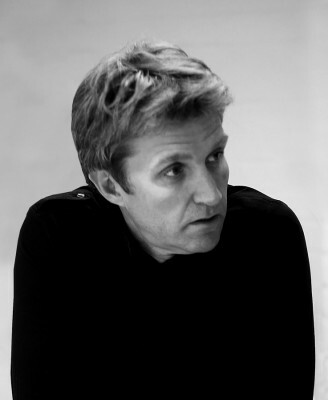 Keith is the founder and director of design at London based Keith Williams Architects. Noted for his work on cultural and civic buildings such as the Unicorn Theatre, Wexford Opera House and the Novium Museum, Chichester his firm works internationally across a broad range of sectors and has received nearing 40 national and international design awards for his work, including several Civic Trust Awards, Keith is a member of the Royal Institute of the Architects of Ireland, a Fellow of the Royal Society of Arts, and a member of the Royal Institute of British Architects. He sits on numerous design review and awards panels, has lectured widely on architecture and his firm’s work, and in 2009 was made Honorary Visiting Professor of Architecture at Zhengzhou University, China. Keith Williams is design director of Keith Williams Architects (KWA), a firm with a stream of accolades supporting its fast growing international reputation for the creation of dramatic, innovative architecture. The London based firm was BD Public Building Architect of the Year 2006 and has won over 20 major design and construction awards for its built projects. Keith Williams, fellow director Richard Brown and their teams have been active in Ireland since 2001 where major projects include the multi-award winning Athlone Civic Centre, Co. Westmeath 2001-2004. Currently at construction stage KWA are working jointly with the OPW on the new 7,500 sqm, 800 seat Wexford Opera House 2005 – 2008, and solely on Clones Library & County HQ, Co. Monaghan 2004-2008. Elsewhere, inert alia, the firm’s award winning Unicorn Theatre, London was completed 2005, The Long House, London 2007, whilst at design stage the firm is working on the new Marlowe Theatre complex in Canterbury, the new district Museum in Chichester. Keith Williams is a specialist designer of cultural buildings including theatres, opera houses, museums and galleries, libraries, civic centres, and frequently faces the challenge of building in a tight urban or historic context. 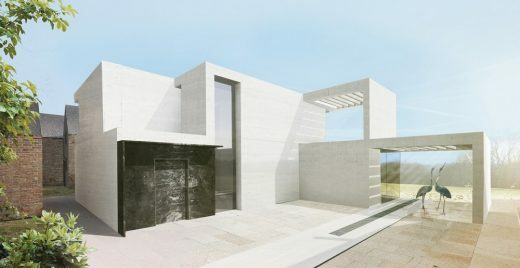 He is a member of the Royal Institute of Architects of Ireland, a Fellow of the Royal Society of Arts, and a member of the Royal Institute of British Architects. Williams has given numerous lectures on the firm’s work which has also been published worldwide. March 11, 2018 in Architects.